Two years ago there were major staff cuts all across the Pacifica Network – all except KPFA. For the rest of the network salaries and related expenses were cut 18.5 percent from 2008 to 2010 – from $6.3 million to $5.1 million. But at KPFA the reduction was just 6.1 percent – from $2.4 million to $2.3 million. Meanwhile, KPFA’s total income dropped by 21.1 percent over the same time period – from $4.5 million to $3.6 million. And KPFA’s “working capital” reserves dropped from a little over $1 million as of Sept. 30, 2007, to negative -$190,435 as of Sept. 30, 2010. 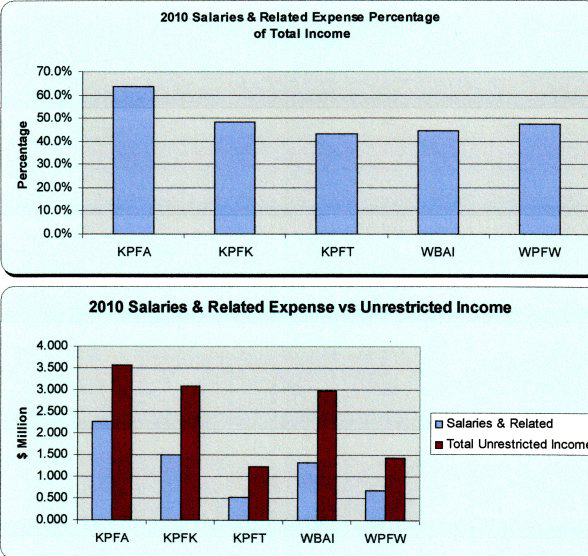 For some perspective, KPFA’s salaries and related expenses were 63.8 percent of total income in FY 2010, while all the other Pacifica stations had reduced theirs to under 50 percent. The budgets called for major staff cuts, but only minor cuts were made – mainly by not filling vacancies and a few staff hours were cut here and there. Over the past 10 years no manager has lasted more than a few months at KPFA who actually attempted to manage the station. It’s a long sad story, with some ugly twists and turns, but any manager who attempted anything that did not meet the approval of a small core group of staff members – the foxes in the henhouse – met with so much hostility and non-cooperation that the job became nearly impossible to do. The last manager lasted about a month before he threw up his hands and resigned. KPFA has essentially been run by a few powerful staff members for a decade or more, with compliant managers. Over the past 10 years, no manager has lasted more than a few months at KPFA who actually attempted to manage the station. Any manager who attempted anything that did not meet the approval of a small core group of staff members – the foxes in the henhouse – met with so much hostility and non-cooperation that the job became nearly impossible to do. So long as KPFA still had reserves to go through – even though income was dropping precipitously – there could be no staff cuts at KPFA that offended that core staff group. KPFA’s compliant management proposed two years in a row to cancel Flashpoints and cut Hard Knock Radio – whose staff are definitely not members of the KPFA core staff elite – to make up the budget gap. But successive Pacifica executive directors, Grace Aaron (in 2009) and Arlene Engelhardt (in 2010), would not agree, as those cuts would have affected very senior staff members. So, there was a stalemate at KPFA until the cash was all gone last fall and Engelhardt had to take action. People can argue ‘til the cows come home about whose favorite programs should be cut. But, under the union contract, if more senior staff are laid off, they then have the right to “bump” less senior staff out of their positions if they are qualified to fill them. So laying off the Flashpoints and HKR staff would have cascaded downward causing far more disruption to programming than Engelhardt’s decision to lay off the less senior Morning Show staff. In fact, that’s what Brian Edwards-Tiekert eventually did – he bumped John Hamilton from the news department, and then several staff members volunteered to cut their hours so Hamilton could stay on part time. Hamilton is the only staff member with less seniority than Aimee Allison, so there is no one left for her to bump. None of this has prevented the “KPFAWorker/SaveKPFA” group from running a relentless agit-prop campaign to get Brian and Aimee and The Morning Show restored. They apparently are willing to take down the station and the whole Pacifica Network if they don’t get their way – childish, destructive behavior. The “KPFAWorker/SaveKPFA” group has been running a relentless agit-prop campaign to get Brian and Aimee and The Morning Show restored. They apparently are willing to take down the station and the whole Pacifica Network if they don’t get their way. This has begun to take its toll on listener patience – many are tuning out, and this fund drive isn’t going well, which could result in more layoffs and a vicious downward spiral. New interim manager Andrew Phillips and program director Carrie Core are making the best they can of a bad situation with non-cooperative “core staff” members. They need our support to pull the station through and begin the revitalization of the station with the resources they have. So, again, now is the time to donate generously to this fund drive. Don’t be fooled by slogans. KPFA’s financial problems and layoffs had nothing to do with “local control” and everything to do with local foxes raiding the henhouse – until they ran through all the cash. Some members of the KPFA punditocracy and “policy elites” around the station have lately suggested that KPFA should separate from the Pacifica Network or even that Pacifica shouldn’t exist. These sagely pronouncements are coupled with hot-button phrases about “restoring local control,” “wasteful Pacifica National spending,” “corporatizing,” “just like 1999,” and so on. Unpacking those phrases I’ll save for another day. But this is NOT 1999. I didn’t know much about Pacifica 12 years ago when we started our campaign to remove the old self-selecting board and to democratize Pacifica governance. I was just a long-time KPFA listener who loved our station and didn’t believe armed guards should be prowling around the place locking the staff out. But, after we won that campaign in December 2001, I sat on the national board of directors for three years – from January 2002 through January 2005. I also sat on the KPFA local board for five years – from April 2000 through April 2005. During that period my perspective broadened. I gained an appreciation for what Pacifica is and could be if we all pulled together to work in our common interests. The Pacifica Foundation was founded in 1946 by World War II pacifist Lewis Hill and others for the purpose of radio broadcasting “to contribute to a lasting understanding between nations and peoples of all races, creeds and colors,” “to promote the study of political and economic problems and the causes of religious, philosophical and racial antagonisms,” “to encourage and provide outlets for the creative skills and energies of the community,” “to provide performance facilities” for musicians and the arts, “to obtain access to sources of news not commonly brought together in the same medium” and to be “as nearly self-sustaining as possible” through listener-sponsorship rather than commercial sponsorship – a novel idea at the time. There is a timeline of Pacifica’s remarkable history here. KPFA first went on the air on April 15, 1949. In 1959, KPFK in Los Angeles began broadcasting with Terry Drinkwater as its first station manager. In 1960 WBAI in New York was given to Pacifica by philanthropist Louis Schweitzer. KPFT in Houston joined the network and was promptly bombed off the air twice by the KKK. In 1977, WPFW went on the air in Washington, D.C., after winning a six-year competitive process for the last available frequency in the nation’s capital. In 1972, Pacifica Radio Archives and Program Service were established to preserve and distribute Pacifica programming to schools, libraries, individuals and other community radio stations across the country. 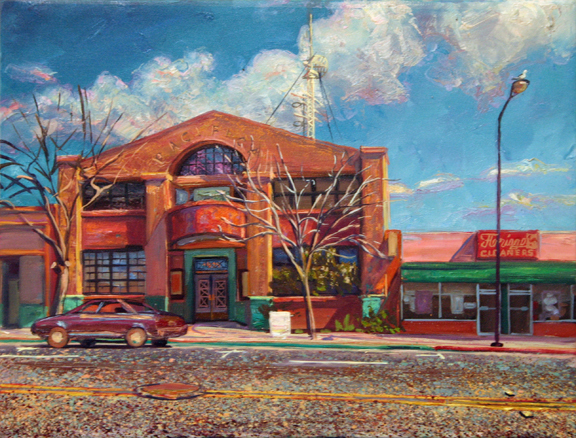 In 2002, after a decade or more of neglect, Pacifica Radio Archives embarked on a long-term preservation and access project under the leadership of then newly hired Archives Director Brian de Shazor, with the goal of assessing, preserving and making available to the widest possible public historic radio programs of the highest social, cultural and artistic value in its collection of approximately 40,500 original audio tapes. These programs, mostly dating from the 1950s through the 1980s, document the essential movements, experiments and musings of the latter half of the 20th century, as broadcast on one or more of the five Pacifica radio stations. The former Pacifica Program Service is now the Pacifica Affliates Network with 133 affiliated independent community radio stations and internet broadcasters across North America and beyond. Pacifica Affiliates Coordinator Ursula Reudenberg worked tirelessly this past decade to rebuild the affiliates program, which had shrunk to under 60 affiliates back in 2001, and to help new stations in far flung underserved places obtain broadcast licenses. This is the only radio network in the country regularly countering the mainstream and NPR propaganda parrots, not to mention right-wing hate radio, with KPFA programs like Flashpoints and Letters & Politics, and independently produced programs like Democracy Now! and Free Speech Radio News and, most recently, Al Jazeera English News, as well as many programs that are shared among Pacifica and affiliate stations through the Pacifica audioport program exchange and satellite. This is the only radio network in the country regularly countering the mainstream and NPR propaganda parrots, not to mention right-wing hate radio. The Affiliates Program is self-supporting and contributes to network-wide expenses for programming, overhead and infrastructure that also benefit the five Pacifica stations. Maybe living in the progressive bubble that is the San Francisco Bay Area, some KPFA pundits don’t think it matters that these alternative voices are heard in fly-over country – places like Gallup, N.M., Eau Claire, Wisc., Spokane, Wash., Athens, Ga. etc. In addition to these important projects, the Pacifica National Office provides accounting services, technical assistance and infrastructure, satellite service, the annual audit, the FCC attorney, insurance … and financial support when stations run into difficulties. By pooling the stations’ resources, there are economies of scale, and all this works well – when the stations are paying their share of “central services.” KPFA’s central services share last fiscal year was $504,925, or about 12.2 percent of total station expenses. But unfortunately, KPFA ended the year $507,060 in debt to the National Office for unpaid central services plus additional KPFA expenses that had been paid by the national office due to cash shortage problems at KPFA. So please, donate generously to KPFA this fund drive – to keep KPFA on the air AND to support all of Pacifica’s worthy work bringing alternative news and views to listeners across the country. Please donate generously to KPFA this fund drive – to keep KPFA on the air AND to support all of Pacifica’s worthy work bringing alternative news and views to listeners across the country. Why is a prominent Republican lawyer – former chair of Lawyers for Bush/Cheney and for John McCain – doing pro-bono legal work for Brian Edwards-Tiekert and Mitch Jeserich in a matter against KPFA and Pacifica? You can read Daniel Borgstrom’s very interesting article here. Carol Spooner, who served on the Pacifica National Board from January 2002 through January 2005 and on the KPFA Local Board from April 2000 through April 2005, was founder of the Committee to Remove the Pacifica Board and lead plaintiff on “the Listeners’ Lawsuit” from July 1999 through December 2001. She can be reached at wildrose@pon.net. Previous articleClass is in session: an interview wit’ rapper Professor A.L.I. Housing and Dignity Village: Did the City Of Oakland mislead the judge? first let me say i do contribute financially to kpfa/kfcf fresno. not much but i do what i can. I would just like to comment I listen to the station 1-2 hours per day and I just think you have an amazing station. the information is powerfull and penetrating. i have often had to call friends and family with comments like guess what I just heard on kpfa. I love the music, the programs, the volunteers etc. im deeply moved by the stations attempt to humanize the many underdogs particularly the plight of the palestenian people. with all that and Im sure much much more it would be catastrophic if the demise of the station was the result of internal squabling and inability to work together rather than from an apathetic unmotivated listenership. I will continue to listen and support the station as much as can. I think that shutting down the Morning Show was a mistake. I am withholding my contributions to KPFA till that is put right. They obviously have the money as it was offered in a grant and they refused. The situation is entirely political and has resulted in union jobs being cut back and lost to be replaced by free volunteers. What a blow to labor by a progressive organization. I urge everyone to let the station management know that you are withholding funds and why. They need to be educated in how a local non-profit is run it seems. This is new technology in the windows 10 where you can see the best example of the synchronisation between of the windows 10 computer and printer add wifi printer windows 10. Here you have the option by which you can use easily for the stable a connection. RRB Secunderabad Admit Card 2018 will be sent to the candidates through the registered email ID before 15 days of the exam, so the candidate has to check the mails regularly before the commencement of the exam.